Between the roar of incoming trains, the soothing strains of Beethoven's "Fur Elise" or Ben E. King's "Stand By Me" float across the platforms of Seoul's labyrinthine subway network. The music fades and a preacher-like male voice intones: "Dear passengers, let's think again about the parents and sisters and brothers we love and the preciousness of our life." Seoul's subway authorities hope the music and those exhortations will help relieve the stress of harried Seoul citizens and fight a growing social problem: people who leap to their deaths in front of subway trains. Driven by debt, lost love, terminal disease and other miseries, 95 people killed themselves in Seoul's subway system last year, up from the 58 in 2002. So far this year, 37 people have ended their lives the same way. 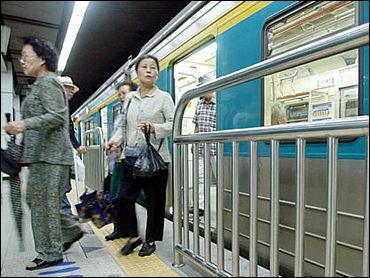 Some nervous jumpers put black plastic bags over their heads to block out their surroundings and maintain their resolve just before leaping in front of an oncoming train, said Park Suk-soon, an official at Seoul Metropolitan Rapid Transit Corp., one of three corporations that run the capital's subway network. "For some reason, those suicidal people who don't wear bags sometimes lock their eyes with the drivers in the split second before they are hit by the train," he said. One driver who exchanged gazes with a man who died under his train later suffered a mental breakdown and was transferred to a non-driving post. In an unrelated case last year, a subway driver with a history of mental problems committed suicide by jumping in front of a colleague's train. "We are shocked by the sudden rise in the suicide figures," said Lim Jong-hyuk, an official at the Korea National Railroad. "The goal of our 'music therapy' is to soothe the minds of potential suicides. Experts say it works on animals." The recent surge in subway deaths has shocked many in South Korea, where such public suicides are rare. So early this month, subway stations began broadcasting 76 tunes that experts say will help people think twice about their "spur-of-the-moment suicidal impulses." The songs include Frank Sinatra's "Send in the Clowns," "Sailing" by Rod Stewart, and Simon & Garfunkel's "Bridge Over Troubled Water." The so-called "suicide-prevention music" is one of several measures introduced by Seoul's subway system, which carries 6 million passengers daily. Authorities are setting up "safety-fences" — screen doors along the platforms that open only when a train pulls in. They also plan to install emergency buttons for platform passengers to alert drivers when they spot a person who appears to be on the verge of jumping. Stations broadcast recorded appeals to passengers to show more care for neighbors. Posters and leaflets provide contact numbers for free counseling. "Giving up your life will inflict an unbearable pain on your family and the society!" Statistics show 13,005 South Koreans killed themselves last year, more than the 12,458 who committed suicide in 1998 at the height of the Asian financial crisis, a traumatic period for the nation of 48 million people. The suicide rate is marginally higher than in neighboring Japan, where 32,080 people killed themselves in 2003. Japan's total population is roughly 126 million. Subway suicides have also been a problem in Japan. In Tokyo, authorities once installed mirrors on the wall at the incoming end of platforms, where most people jump, theorizing that people would change their mind if they looked at their own image. Subway stations are not the only place Seoul authorities are on alert for suicides. Some 60 people have attempted suicide this year by jumping off bridges into the Han River, which flows through Seoul. Of them, 41 died. Police were dispatched to the bridges to stop jumpers. The measure was taken after three high-profile figures implicated in corruption scandals jumped to their deaths from the Han River bridges this year. But it didn't stop a local businessman from jumping off a bridge on Sunday night. The businessman was implicated in a scandal in which food companies made dumplings with unhygienic radishes. When the man jumped off, there were no police patrolling on the bridge. They had been diverted to monitor demonstrations elsewhere in the city.